We spent Saturday evening celebrating Johann Sebastian Bach’s 330th birthday. 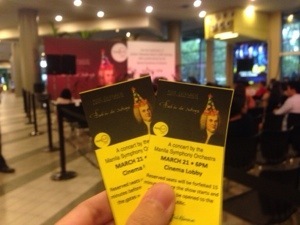 It’s been a while since I listened to orchestra music, so I knew I really wanted to go when I found out that there would be a free performance by the Manila Symphony Orchestra at Trinoma Mall. I’m grateful that Ian shared my interest in the music. We are no experts and I’ve personally lost the knowledge to point out the technical aspects of the music, but its no deterrent in enjoying the performance. We had to get the free tickets at the concierge. It was free but they wanted you to get the tickets anyway. 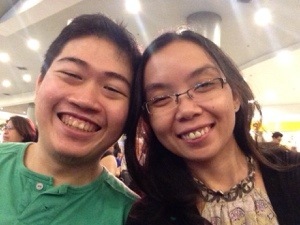 We went to Trinoma early and we were the 4th and 5th to claim tickets. I was worried at first that tickets would quickly run out, after which I worried that few people would be there. 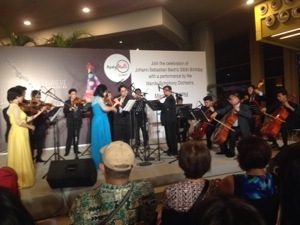 It may not be the best space for the orchestra, but the mere fact that they were trying to reach out to the public is a good thing. I remember this article about an acclaimed violinist who performed in the subway but barely anyone gave him notice. It is sad to think that people won’t stop for good music, but the premise of that experiment is faulty. People go in the subway because they have to be somewhere—they need to go to work or to their appointments. Surely, in an ideal world, we should all stop and smell the flowers. But if stopping or slowing down mean you would compromise your job that you and your family rely on to survive, its a decision you can’t really afford to make. I remember thinking that they should’ve placed the violinist in a place of leisure, perhaps in a public park that people go to. Now, we have the same concept. I don’t think it would work in our MRT/LRT because of the crowd and our noisy train. Our public transportation system is simply too chaotic and unsafe. The mall is a commercial space rather than a public one, but it also means that the people there are at their leisure. Saturday being a weekend also mean that they are not rushing to their workplace. It is a good time and space for the performance. It took a while for the audience space to fill up but when we got there, the best seats were already taken. I saw it as a sign that there is a group of people that are really interested to listen to the performance. The elderly man who was beside us moved to the empty seats so we can sit together nearer the centre. It was really nice of him. I also noticed that he was reading a book entitled Ho Chi Minh, and I wonder if he’s been there or is planning to go. Maybe I should’ve asked, and perhaps if I wasn’t in Manila, I would have. Eventually, they opened up the seats to the public and it quickly filled up. I’m happy to see that a lot of people will get to see the performance. The music was absolutely lovely. The condition wasn’t perfect, the acoustic was nowhere near ideal. But you see and hear the passion of the performers. It’s music that you feel, not just listen to. I wish I can explain the explicit details of the music, but as I have mentioned earlier, I can’t. Yet, it doesn’t feel as important as the experience of being there and simply listening, feeling, and enjoying. The voice-over mentioned that the performance is happening simultaneously all over the metro. They also repeated ask for us to spread the word and use the hashtag #bachinthesubways. I get the importance of this. I really want more people to listen and realise the beauty of the music. It made me smile when I saw a big crowd of people outside the audience area listening to the music. You feel the excitement and the emotions of the crowd. I wish there are more performances like these that are accessible to the public. Our performance space is usually the Cultural Center of the Philippine (CCP) and it is rather far and difficult to access. I envy other countries whose performance spaces are right in the middle of the town or city where people can readily go and enjoy it. I truly believe that the Filipino people need more exposure and easy access to the arts. 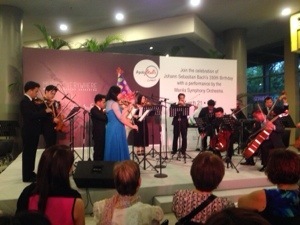 The Manila Symphony Orchestra played the Brandenburg Concerto No. 4 last. In my mind, I was seeing the Brandenburg Gate again, thinking to myself how amazing the world is. It was a lovely and lively piece. I wish I can describe it more, but it is something that must be heard and experienced. My own time in Berlin gives the experience another layer in my mind, even though Bach didn’t actually spend time there. Everybody gave them a loud applause and we left with a certain calm and joy. I only wish that we can go to a pub and have beers and schnitzel. Or maybe learn the violin and the pianoforte. Johann Sebastian Bach is an important composer under the Baroque movement. His family was largely composed of musicians and teachers. The Baroque period in the arts is more emotional and moving than the Renaissance that preceded it. It is a period of change, and for music, the baroque period will lay the groundwork for the classical period. This entry was posted on March 24, 2015 by Portia Placino in Diary of a Grad student, Portia's Narratives, Random Writings and tagged art, bach, bachinthesubways, Baroque, music, orchestra, symphony.